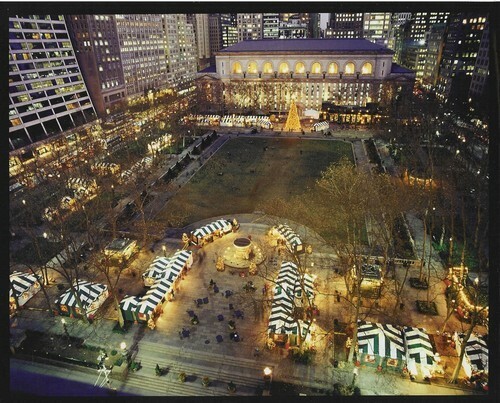 The first holiday market in Bryant Park, 2002. Vendors sold their wares from green and white striped tents. The lawn remained open to the public during the winter season. 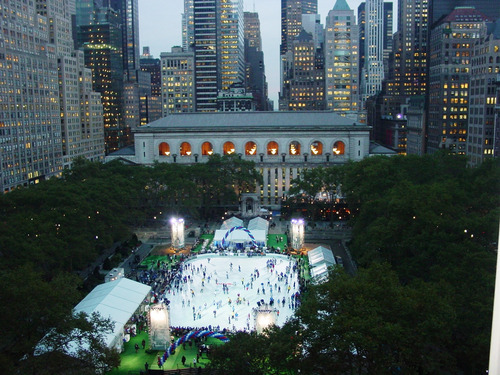 The Pond at Bryant Park is born, 2005. The Pond Pavilion (for admission and skate rentals) was positioned at the Northwest corner of the ice rink. A temporary restaurant, the “Ice Cafe”, was centered on the East end of the ice. 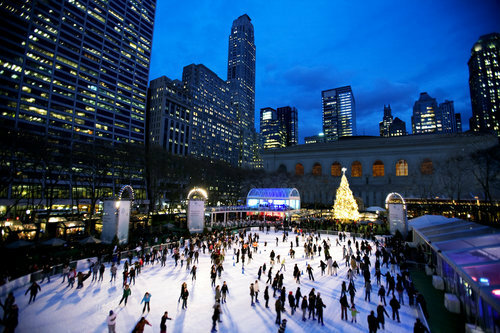 The Pond and The Holiday Shops at Bryant Park, 2008. This year’s set up is almost identical to 2008’s, with a few tweaks here and there. All Holiday Shops vendors are housed in dark green “jewel box” structures, designed by Bryant Park Corporation’s Director of Industrial Design, Ignacio Ciocchini. The Pond Pavilion is on the South side of the ice rink and almost double the size of the original structure, with sleek interior furnishings. Renamed “Celsius” in 2006, the seasonal restaurant has evolved into a two-story structure with stunning views at the Northeast corner of the rink. From the very beginning, Bryant Park Corporation has partnered with the fine folks at Upsilon Ventures to produce and manage The Pond and The Holiday Shops.